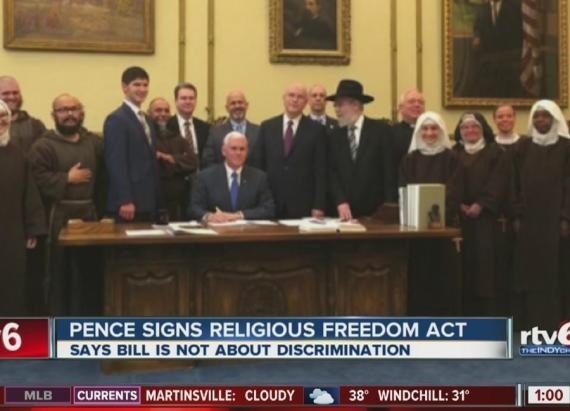 Indiana Governor Mike Pence signed a new Religious Freedom Restoration Act yesterday. That could have some dire consequences. If we are to believe the media, this means that businesses are going to start turning gay people away at the door and Indiana is going to be a horrible place to be gay. Let’s take a step back and be real about all of this. First of all the, Federal Government passed a Religious Freedom Restoration Act in 1993, this Act was signed with the intention of government not being able to infringe upon a person’s ability to freely exercise of his or her religion. This law was passed, in 1993, so that the government could not infringe on Native American land or the use of peyote in Native American religious ceremonies. In 1997, in the case of City of Boerne v. Flores, the Supreme Court Ruled that the Religious Freedom Restoration Act did not apply to the states because of the 14th Amendment and after this states began passing their own Religious Freedom Restoration Acts. Since 1997 nineteen states have signed Religious Freedom Restoration Acts, with Alabama making theirs a state constitutional amendment. A state or local government cannot prevent anyone from exercising their religion unless it’s for a compelling government interest. If it is limited, it must be done in the least restrictive way. I don’t think those two lines are what people have problems with. Let’s keep looking. “A person whose exercise of religion has been substantially burdened, or likely to be substantially burdened by state or local government action may state their claim in court whether or not the government is a party to the case.” Blah, blah, blah you can get money or other relief. The interpretation of the emphasized lines is where things get tricky. If someone is substantially burdened by state or government action, then how would the government not be party to the case? This is why so many news outlets and people see this law as being problematic. Because that line implies that individuals (business owners) can claim that another person is burdening their religious freedom, and the law would agree with them. Toleration goes both ways and this law doesn’t seem to do so. The lawmakers may have had all the good intentions in the world, but the way this law is written, it’s creating all the lawsuits in the world.